Through the lobbying efforts of Jeremiah N. Reynolds, the United States House of Representatives passed a resolution on May 21, 1828, requesting President John Quincy Adams to send a ship to explore the Pacific. Adams was keen on the resolution and ordered his Secretary of the Navy to ready a ship, the Peacock, while the House voted an appropriation in December Yet, the bill stalled in the US Senate in February 1829. However, under President Andrew Jackson, Congress passed legislation in 1836 approving the exploration mission. Yet again, the effort stalled under Secretary of the Navy Mahlon Dickerson until President Van Buren assumed office and pushed the effort forward. 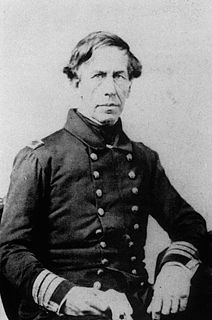 Originally, the expedition was under the command Commodore Jones, but he resigned in November 1837, frustrated with all of the procrastination. Secretary of War Joel Roberts Poinsett, in April 1838, then assigned command to Wilkes, after more senior officers refused the command. Wilkes had a reputation for hydrography, geodesy, and magnetism. Additionally, Wilkes had received mathematics training from Nathaniel Bowditch, triangulation methods from Ferdinand Hassler, and geomagnetism from James Renwick. Personnel included naturalists, botanists, a mineralogist, a taxidermist, and a philologist. They were carried aboard the sloops-of-war USS Vincennes (780 tons), and USS Peacock (650 tons), the brig USS Porpoise (230 tons), the full-rigged ship Relief, which served as a store-ship, and two schooners, Sea Gull (110 tons) and USS Flying Fish (96 tons), which served as tenders. On the afternoon of August 18, 1838, the vessels weighed anchor and set to sea under full sail. By 0730 the next morning, they had passed the lightship off Willoughby Spit and discharged the pilot. The fleet then headed to Madeira, taking advantage of the prevailing winds. The expedition consisted of a great many people, a lot of whom were not assigned to any specific vessel. Others served on more than one vessel. Wilkes was to search for vigias, or shoals, as reported by John Purdy, but failed to corroborate those claims for the locations given. The squadron arrived in the Madeira Islands on September 16, 1838, and Porto Praya on October 6. The Peacock arrived at Rio de Janeiro on November 21, and the Vincennes with brigs and schooners on November 24. However, the Relief did not arrive until the November 27, setting a record for slowness, 100 days. While there, they used Enxados Island in Guanabara Bay for an observatory and naval yard for repair and refitting. The Flying Fish reached 70° on March 22, in the area about 100 miles north of Thurston Island, and what is now called Cape Flying Fish, and the Walker Mountains. The squadron joined the Peacock in Valparaiso on May 10, but the Sea Gull was reported missing. On June 6, the squadron arrived San Lorenzo, off Callao for repair and provisioning, while Wilkes dispatched the Relief homewards on June 21. Leaving South America on July 12, the expedition reached Reao of the Tuamotu Group on August 13, and Tahiti on September 11. They departed Tahiti on October 10. The expedition then visited Samoa and New South Wales, Australia. 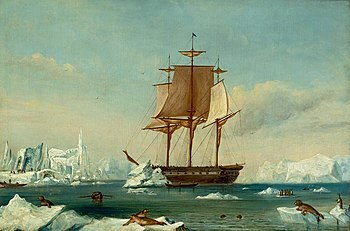 In December 1839, the expedition sailed from Sydney into the Antarctic Ocean and reported the discovery of the Antarctic continent on January 16, 1840, when Henry Eld and William Reynolds aboard the Peacock sighted Eld Peak and Reynolds Peak along the George V Coast. On the January 19, Reynolds spotted Cape Hudson. On January 25, the Vincennes sighted the mountains behind the Cook Ice Shelf, similar peaks at Piner Bay on January 30, and had covered 800 miles of coastline by February 12, from 140° 30' E. to 112° 16' 12"E., when Wilkes acknowledged they had "discovered the Antarctic Continent." Named Wilkes Land, it includes Claire Land, Banzare Land, Sabrina Land, Budd Land, and Knox Land. They reached a westward goal of 105° E., the edge of Queen Mary Land, before departing to the north again on February 21. The Porpoise came across the French expedition of Jules Dumont d'Urville on January 30. However, due to a misunderstanding of each other's intentions, the Porpoise and Astrolabe were unable to communicate. In February 1840, some of the expedition were present at the initial signing of the Treaty of Waitangi in New Zealand. Some of the squadron then proceeded back to Sydney for repairs, while the rest visited the Bay of Islands, before arriving in Tonga in April. At Nuku'alofa the met King Josiah (Aleamotu'a), and the George (Taufa'ahau), chief of Ha'apai, before proceeding onwards to Fiji on May 4. The Porpoise surveyed the Low Archipelago, while the Vincennes and Peacock proceeded onwards to Ovalau, where they signed a commercial treaty with Tanoa Visawaqa in Levuka. Edward Belcher's HMS Starling visited Ovalau at the same time. Hudson was able to capture Vendovi, after holding his brothers Cocanauto, Qaraniqio, and Tui Dreketi (Roko Tui Dreketi or King of Rewa Province) hostage. Vendovi was deemed responsible for the attack against US sailors on Ono Island in 1836. Vendovi was to be taken back to the US after a brief trial on board. In July 1840, two members of the party, Lieutenant Underwood and Wilkes' nephew, Midshipman Wilkes Henry, were killed while bartering for food in western Fiji's Malolo Island. The cause of this event remains equivocal. Immediately prior to their deaths, the son of the local chief, who was being held as a hostage by the Americans, escaped by jumping out of the boat and running through the shallow water for shore. The Americans fired over his head. According to members of the expedition party on the boat, his escape was intended as a prearranged signal by the Fijians to attack. According to those on shore, the shooting actually precipitated the attack on the ground. The Americans landed sixty sailors to attack the hostile natives. Close to eighty Fijians were killed in the resulting American reprisal and two villages were burned to the ground. On August 9, after three months of surveying, the squadron met off Macuata. The Vincennes and Peacock proceeded onwards to the Sandwich Islands, with the Flying Fish and Porpoise to meet them in Oahu by October. Along the way, Wilkes named the Phoenix Group and made a stop at the Palmyra Atoll, making their group the first scientific expedition in history to visit Palmyra. While in Hawaii, the officers were welcomed by Governor Kekuanaoa, King Kamehameha III, his aide William Richards, and the journalist James Jackson Jarves. The expedition surveyed Kauai, Oahu, Hawaii, and the peak of Mauna Loa. The Porpoise was dispatched in November to survey several of the Tuamotus, including Aratika, Kauehi, Raraka, and Katiu, before proceeding onwards to Penrhyn and returning to Oahu on 24 March. On April 5, 1841, the squadron departed Honolulu, the Porpoise and Vincennes for the Pacific Northwest, the Peacock and Flying Fish to resurvey Samoa, before rejoining the squadron. Along the way, the Peacock and Flying Fish surveyed Jarvis Island, Enderbury Island, the Tokelau Islands, and Fakaofo. The Peacock followed this with surveys of the Tuvalu islands of Nukufetau, Vaitupu, and Nanumanga in March, followed by Tabiteuea in April. Also in April, the Peacock surveyed the Gilbert Islands of Nonouti, Aranuka, Maiana, Abemama, Kuria, Tarawa, Marakei, Butaritari, and Makin, before returning to Ohau on June 13. The Peacock and Flying Fish then left for the Columbia River on June 21. After making another search, the man was not found and the natives began arming themselves. Lieutenant Walker returned his force to the ship, to converse with Hudson, who ordered Walker to return to shore and demand the return of the sailor. Walker then reboarded his boats with his landing party and headed to shore. Walker shouted his demand and the natives charged for him, forcing the boats to turn back to the ships. It was decided on the next day that the Americans would bombard the hostiles and land again. While doing this, a force of around 700 Gilbertese warriors opposed the American assault, but were defeated after a long battle. No Americans were hurt, but twelve natives were killed and others were wounded, and two villages were also destroyed. A similar episode occurred two months before in February when the Peacock and the Flying Fish briefly bombarded the island of Upolu, Samoa following the death of an American merchant sailor on the island. The Vincennes and Porpoise reached Cape Disappointment on April 28, 1841, but then headed north to the Strait of Juan de Fuca, Port Discovery, and Fort Nisqually, where they were welcomed by William Henry McNeill and Alexander Caulfield Anderson. The Porpoise surveyed the Admiralty Inlet, while boats from the Vincennes surveyed Hood Canal, and the coast northwards to the Fraser River. Wilkes visited Fort Clatsop, John McLoughlin at Fort Vancouver, and William Cannon on the Willamette River, while he sent Lt. Johnson on an expedition to Fort Okanogan, Fort Colvile and Fort Nez Perces, where they met Marcus Whitman. Like his predecessor, British explorer George Vancouver, Wilkes spent a good deal of time near Bainbridge Island. He noted the bird-like shape of the harbor at Winslow and named it Eagle Harbor. Continuing his fascination with bird names, he named Bill Point and Wing Point. Port Madison, Washington and Points Monroe and Jefferson were named in honor of former United States presidents. Port Ludlow was assigned to honor Lieutenant Augustus Ludlow, who lost his life during the War of 1812. There, the crew set up "Peacockville", assisted by James Birnie of the Hudson's Bay Company, and the American Methodist Mission at Point Adams. They also traded with the local Clatsop and Chinookan Indians over the next three weeks, while surveying the channel, before journeying to Fort George and a reunion with the rest of the squadron. This prompted Wilkes to send the Vincennes to San Francisco Bay, while he continued to survey Grays Harbor. From the area of modern-day Portland, Wilkes sent an overland party of 39 southwards, led by Emmons, but guided by Joseph Meek. The group included Agate, Eld, Colvocoresses, Brackenridge, Rich, Peale, Stearns, and Dana, and proceeded along an inland route to Fort Umpqua, Mount Shasta, the Sacramento River, John Sutter's New Helvetia, and then onwards to San Francisco Bay. They departed September 7, and arrived aboard the Vincennes in Sausalito on October 23, having traveled along the Siskiyou Trail. Wilkes arrived with the Porpoise and Oregon, while the Flying Fish was to rendezvous with the squadron in Honolulu. The squadron surveyed San Francisco and its tributaries, and later produced a map of "Upper California". The expedition then headed back out on October 31, arriving Honolulu on November 17, and departing on November 28. They included a visit to Wake Island, and returned by way of the Philippines, Borneo, Singapore, Polynesia, and the Cape of Good Hope, reaching New York on June 10, 1842. The expedition was plagued by poor relationships between Wilkes and his subordinate officers throughout. Wilkes' self-proclaimed status as captain and commodore, accompanied by the flying of the requisite pennant and the wearing of a captain's uniform while being commissioned only as a Lieutenant, rankled heavily with other members of the expedition of similar real rank. His apparent mistreatment of many of his subordinates, and indulgence in punishments such as "flogging round the fleet" resulted in a major controversy on his return to America. Wilkes was court-martialled on his return, but was acquitted on all charges except that of illegally punishing men in his squadron. The Wilkes Expedition played a major role in the development of 19th-century science, particularly in the growth of the American scientific establishment. Many of the species and other items found by the expedition helped form the basis of collections at the new Smithsonian Institution. For a short time Wilkes was attached to the Office of Coast Survey, but from 1844 to 1861 he was chiefly engaged in preparing the expedition report. Twenty-eight volumes were planned, but only nineteen were published. Of these, Wilkes wrote the multi-volume Narrative of the United States exploring expedition, during 1838, 1839, 1840, 1841, 1842, Hydrography, and Meteorology. The Narrative concerns the customs, political and economic conditions of many places then little-known. Other contributions were three reports by James Dwight Dana on Zoophytes, Geology, and Crustacea. In addition to shorter articles and reports, Wilkes published Western America, including California and Oregon, and Theory of the Winds. The Smithsonian Institution digitized the five volume narrative and the accompanying scientific volumes. The mismanagement that plagued the expedition prior to its departure continued after its completion. By June 1848, many of the specimens had been lost or damaged and many remained unidentified. Asa Gray was hired to work on the botanical specimens. ^ Adler, Antony (6 October 2010). "From the Pacific to the Patent Office: The US Exploring Expedition and the origins of America's first national museum". Journal of the History of Collections. Charles Wilkes was an American naval officer, ship's captain, and explorer. He led the United States Exploring Expedition, 1838-1842 and commanded the ship in the Trent Affair during the American Civil War (1861–1865), where he attacked a Royal Mail Ship, almost leading to war between the US and the UK. His behavior led to two convictions by court-martial, one stemming from the massacre of almost 80 Fijians on Malolo in 1840. USS Flying Fish (1838), a schooner, was formerly the New York City pilot boat Independence. Purchased by the United States Navy at New York City on 3 August 1838 and upon joining her squadron in Hampton Roads 12 August 1838 was placed under command of Passed Midshipman S. R. Knox. Fakaofo, formerly known as Bowditch Island, is a South Pacific Ocean atoll located in the Tokelau Group. The actual land area is only about 3 km², consisting of islets on a coral reef surrounding a central lagoon of some 45 km². According to the 2006 census 483 people officially live on Fakaofo. Of those present 70% belong to the Congregational Church and 22% to the Catholic Church. The second USS Porpoise was a 224-ton Dolphin class brigantine. 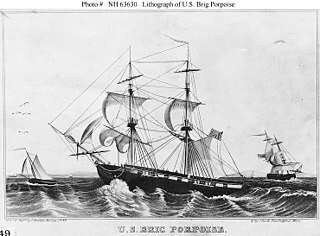 The USS Porpoise was later rerigged as a brig. She was based on the same plans as Dolphin. James Alden Jr. was a rear admiral in the United States Navy. In the Mexican–American War he participated in the captures of Veracruz, Tuxpan and Tabasco. Fighting on the Union side in the Civil War, he took part in the relief of Fort Pickens, followed by many engagements on the Lower Mississippi, before being promoted Captain of USS Brooklyn and assisting in the Union victory in the Battle of Mobile Bay. Knox Coast, part of Wilkes Land, is that portion of the coast of Antarctica lying between Cape Hordern, at 100°31′E, and the Hatch Islands, at 109°16′E. Budd Coast, part of Wilkes Land, is that portion of the coast of Antarctica lying between the Hatch Islands, at 109°16'E, and Cape Waldron, at 115°33'E. It was discovered in February 1840 by the U.S. Exploring Expedition (1838–42) under the leadership of Lieutenant Charles Wilkes, and named by Wilkes for Thomas A. Budd, Acting Master of the sloop Peacock, one of the ships used on the expedition. A portion of the Puget Sound, Budd Inlet, is also named for Thomas Budd. The North Pacific Exploring and Surveying Expedition, also known as the Rodgers-Ringgold Expedition was a United States scientific and exploring project from 1853 to 1856. USS Sea Gull was a schooner in the service of the United States Navy. The Sea Gull was one of six ships that sailed in the US Exploring Expedition in 1838 to survey the coast of the then-unknown continent of Antarctica and the Pacific Islands. The specimens collected on the voyage would later form the backbone of the Smithsonian Institution. Henry Eld was a United States Navy officer, geographer, and Antarctic explorer. Cadwalader Ringgold was an officer in the United States Navy who served in the United States Exploring Expedition, later headed an expedition to the Northwest and, after initially retiring, returned to service during the Civil War. The Battle of Drummond's Island was a conflict between the United States Exploring Expedition and the village of Utiroa on April 1841 at Drummond's Island, which is now named Tabiteuea. The cause of the conflict was the disappearance of the American seaman John Anderson, who was suspected to have been murdered by the village natives. In retaliation, the members of the expedition killed twelve of the natives and burned the village to the ground. The Bombardment of Upolu, in 1841, was the second engagement with islanders of the Pacific Ocean during the United States Exploring Expedition. William Lewis Maury was born in Virginia, the son of William Grymes Maury and Ann Hoomes Woolfolk, and became a midshipman in 1829. His career as a midshipman and lieutenant was marked by his service in the United States Exploring Expedition. Thomas Tingey Craven was a 19th-century United States Navy officer who rose to prominence during the Civil War. Thomas A. Budd was a United States Naval officer.